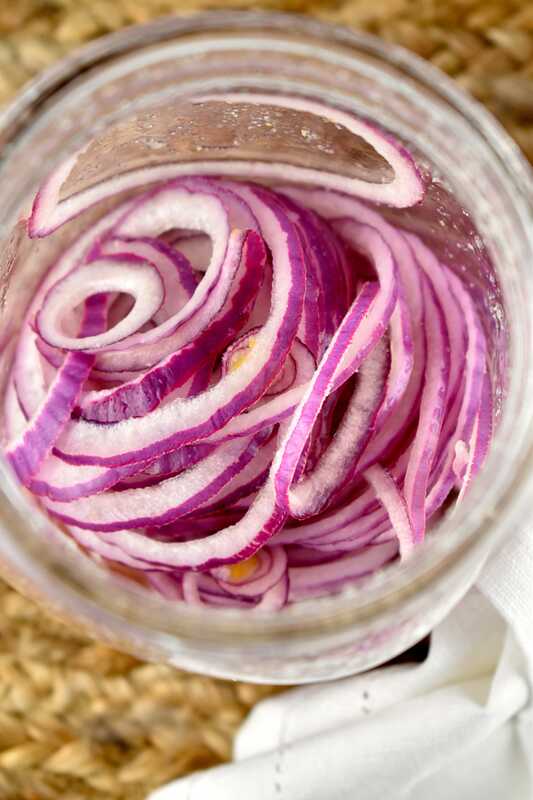 Have you ever had pickled onions? Oh jeez, are they good! I’m astounded at how many ways I’ve found to use them. They are both sweet and tangy at the same time, and will definitely bring a fabulous flavor boost to whatever you decide to put them on. I really don’t know what took me so long to start making these, but after seeing lots of folks using them on Instagram, I felt like it was finally time to give them a try. And I’m so glad I did!! They add such an incredible, sophisticated flavor to my meals. 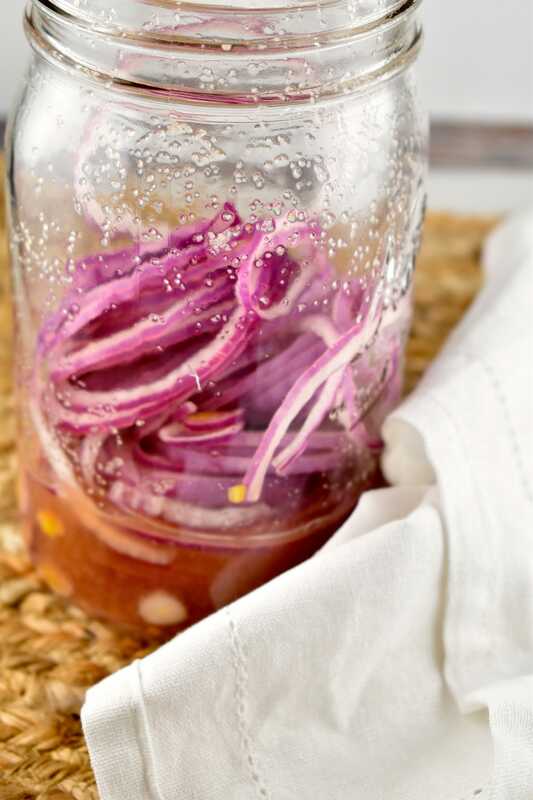 Pickled onions are such a rare, unexpected, under-used condiment that really make an impression, and you’ll start keeping a jar of these beauties in your fridge on the regular. You may notice that my variation does not use sugar. I’m just not a fan of pickled sweet things. Plus, I really don’t want to add extra Points to foods and recipes if I don’t have to. But everyone’s taste varies. So if you like ‘em sweet, you can add 1 tablespoon of sugar to the jar. But if you do, be aware that this will no longer be a 0 Points recipe. 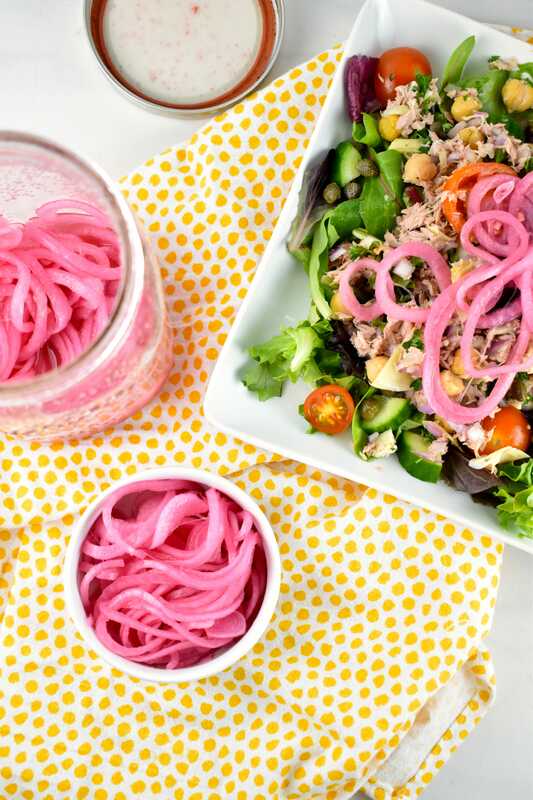 There are so many ways to use pickled onions, it’s impossible to list them all! So I’m sharing my personal favorites. But get creative and find your own new ways to add a serious flavor boost to just about anything. Use these, liberally, on any food that needs an extra zip! A couple of quick notes…. 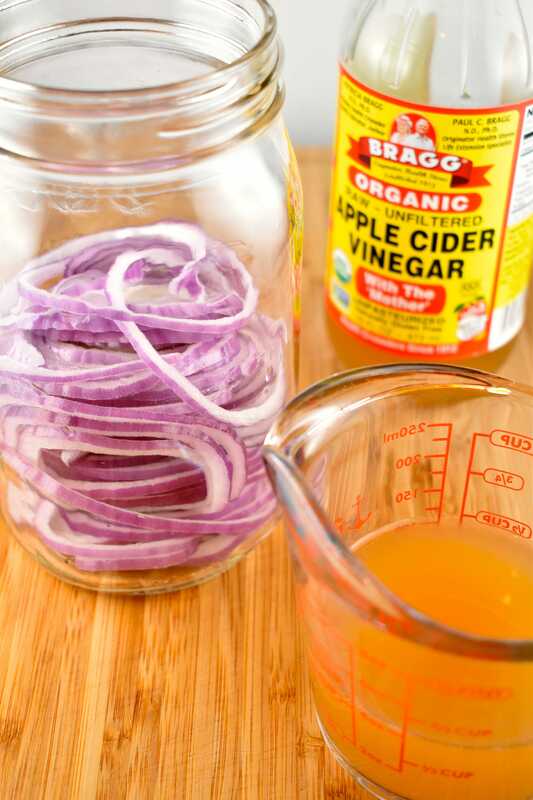 Because of the acidity in this recipe, I prefer to use a glass jar for storing them. They will keep in the fridge for about 2 weeks. But trust me, once you taste them, you’re going to be using them much faster than that! The good thing is that you can make another batch in no time. You can also get creative add some additional flavors with extra spices like peppercorns, cinnamon sticks, whole cloves, crushed red pepper flakes, star anise, fresh ginger slices, coriander seeds, or cumin seeds….you get the idea. LOTS of options with this. 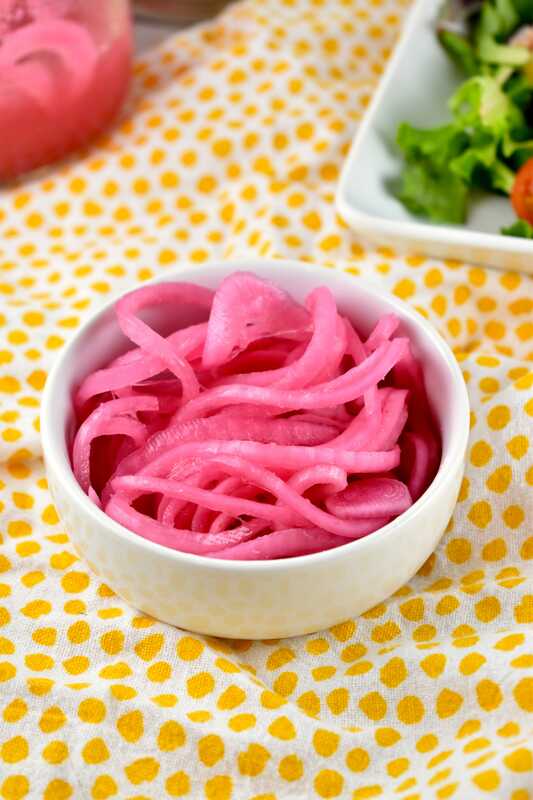 My family has become absolutely obsessed with this Easy Pickled Onions Recipe, and I have doubt you will be too! 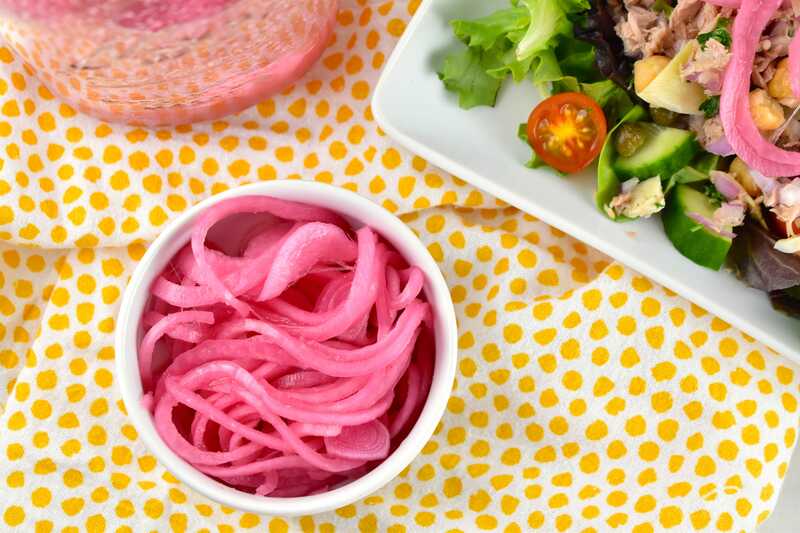 Tangy, sweet, and salty, these pickled red onions will seriously up your condiment game. This quick and simple recipe takes less than 5 minutes to make. 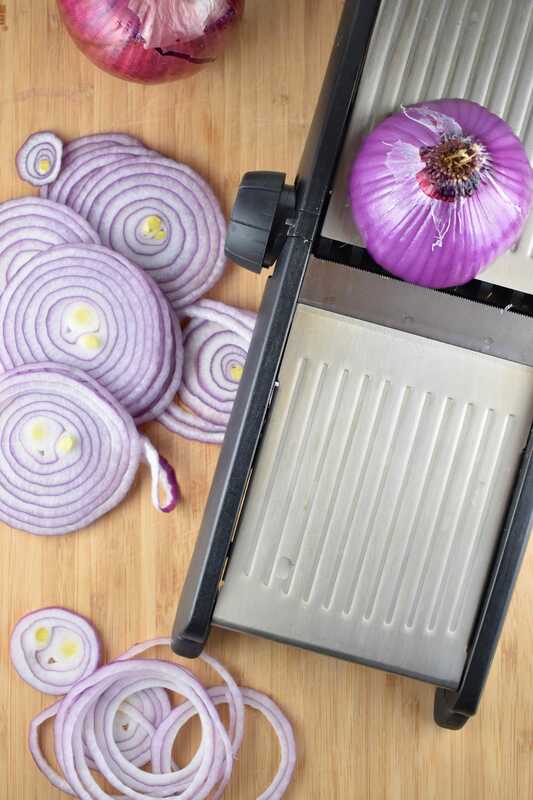 Thinly slice the onion, leaving it in rings. Place the garlic cloves in the bottom of a small jar, and place the onion rings on top of them. Sprinkle salt over the onion rings, and then pour in the vinegar. Put the lid on and shake gently. Allow to sit at room temperature for two hours. Then refrigerate for up to two weeks. I finally tried the pickled inions and I think they’ll be great. But the amount of vinegar didn’t fill the jar. (wide-mouthed pint, an onion, sliced filled it completely). Should it have? I turned it over several times during the next few hours and following day to get all the onions wet. They did wilt down some but the top couple inches is still not as “pickled” as the bottom. Us this a problem?